A Case Study prepared by Bevan & Liberatos. Charleston's compact, charming neighborhoods have a unique urban and architectural character that is so successful and so much in demand, people pay top dollar to live there. One way to relieve the rising prices is to provide new development. But new development should follow Charleston's authentic urban and architectural patterns. Instead of building Anyplace USA, Charleston should be building more of Charleston. Her classic 2-3 story buildings and intimate streets can accommodate the same number of apartments and living units of high-rise (6-story), wide-street developments, but building in Charleston’s traditional pattern offers far more advantages than the non-Charleston building types. The lower scale would be more commercially viable in the long term. It is more environmentally sustainable. It is diverse, local, and aesthetically beautiful. It would provide a more diverse housing stock for a wider range of incomes, a wider diversity of commercial space, and create more local jobs in the building trades. The most charming places in peninsular Charleston are also the most compact. It is not the proposed densities of new projects that are incompatible with the neighborhoods, it is their proposed FORM. There is room in Charleston for more development, but only if it is in keeping with Charleston’s DNA. 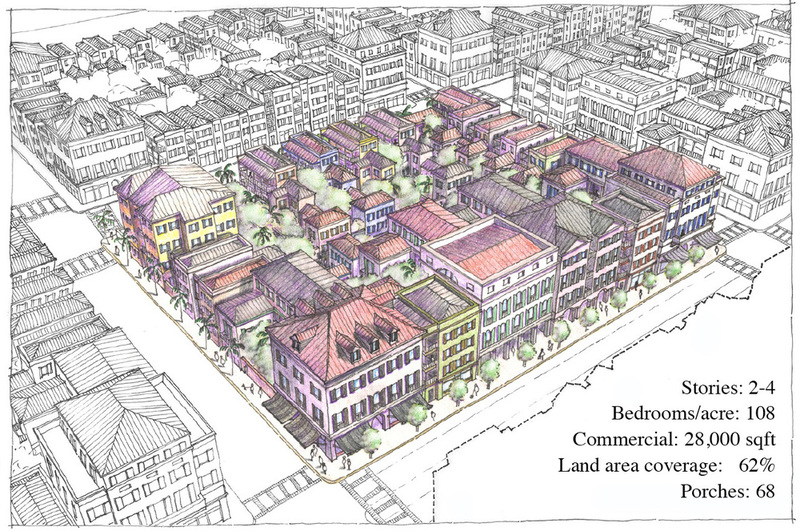 This study asks, instead of a neighborhood of Texas-donuts, what if Charleston-style urbanism and buildings were built in some of these proposed new developments? This is a typical Charleston sized block but built with a non-Charleston building type currently being proposed in town. It is 6 stories. It wraps a parking garage. There are only windows on the street-side of the building. It covers every inch of the block. This is a typical Charleston block. It has the same number of units as the Texas Donut, but with porches, gardens... etc... Buildings are 2, 3 and 4 stories, and there are a wide variety of building types. Buildings cover only 68% of the block leaving the rest open for light, air, gardens, trees and breezes. The WestEdge project is one place in Charleston's Historic District where Texas Donuts are being proposed. Situated along the shore of the Ashley River, the proposed new WestEdge project is one of three major developments currently being planned for peninsular Charleston, by the City of Charleston and a private foundation. The site is a enormous half-mile wide. It runs from Brittlebank Park to the Westside neighborhood at Haygood St., and from Fishburne St. to the Crosstown Expressway (Spring St./Hwy 17). Previously a city dump, this long-neglected site is the same size as the original walled city of Charleston - a 10-minute walk end-to-end. 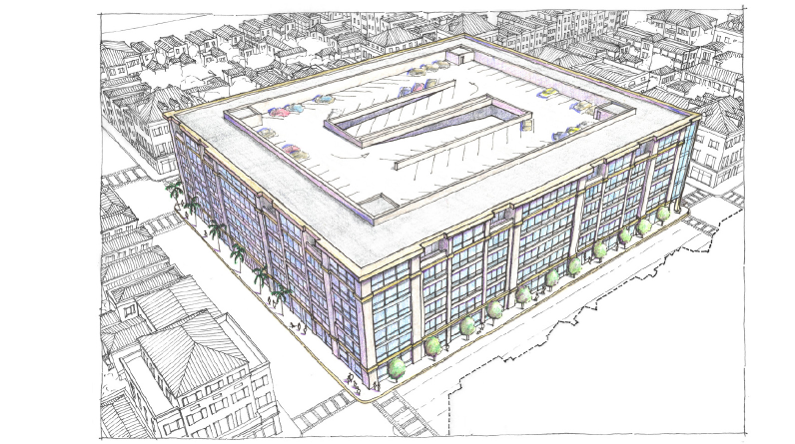 But this large parcel will not be developed with the small blocks and fine grain development that Charleston has grown up with over 350 years. Congestion and traffic cannot be reduced by making streets wider, but it can be mitigated by providing numerous and varied alternative routes. Dead-end, Lshaped, and too-wide streets make congestion worse, and are unsafe for pedestrians and cyclists. The gridded streets of Charleston's historic district are sufficiently wide for modern use, and have numerous advantages over wider ones. New streets in the historic district should follow the Charleston model, not the suburban models proposed in the WestEdge Project. By creating a streets and sidewalks that are safe for pedestrians and comfortable for cyclists, many trips can be made without a car. Multi-modal transit includes walking, biking, driving, and buses or trams linked to regional train stations and airports. When systems are well-designed, many trips are easier, quicker, and more convenient by public transit than in a personal car. This also makes living in Charleston more affordable than living in suburbia. Charleston's urbanism, which provides parking not just on the street, but also between buildings, accommodates more parking than most other types of urbanism. Limiting parking encourages tourists and commuters to use public transportation, taxis and other options. One of the last remaining salvageable tidal creeks on the Peninsula, Gasden's Creek has long been neglected. Rather than rehabilitate the valuable wetlands, the current WestEdge proposal is to put the creek into a culvert and build on top of it. Charleston Waterkeeper, Delete Apathy, and other community members are fighting to preserve the creek. By maintaining the creek, the community would be enhanced in three distinct ways: 1) it would provide a Colonial Lake-like recreational amenity, 2) it would mitigate flooding, and 3) it would help filter water runoff before it gets to the Ashley River. Small buildings are more adaptable for reuse as requirements change over time. Flexible building stock are essential for encouraging small businesses, local start-ups, and an entrepreneurial spirit in a community. Below are two examples of tech companies - one small, one large - that operate out of buildings built in the 1800's in Charleston's historic district. It is easy to get excited about the prospect of the financial infusion that new development promises, but what if the financial benefit could be even greater, and more long-lasting? There are a few ways to assess the financial flow of a new development, first is the question of where and how the profit from construction is dispersed. Will the money invested remain to cycle in the local economy? Will the building program strengthen the local building trades, will there be work for the contractors and handymen whose kids attend the nearby school? How much is the city investing in the infrastructure for the project, and will there be a return on that investment? Then, when the construction project is through, who will own the buildings? Will rents be paid locally? Will there be opportunities for low-income home ownership? Will the new neighborhood give a boost to the local school, or drain resources from it? Will the new buildings house local businesses? How will those businesses invest in the local community? New plans for development should be judged by how well these questions are answered. The value of the properties in Charleston's historic district outpaces others in the area considerably. WestEdge development is about the same size as the original walled city, about 50 or 60 acres. Today, that area is thriving and is home to about 720 residences - which includes houses, rowhouses, stacked condo apartments, duplexes and triplexes, apartment buildings, carriage houses and other outbuildings. Commercial spaces if about 789,000 sq ft - food stores, 3 inns, 5 banks, 11 restaurants, 26 art galleries, and various other small businesses, and great civic and institutional buildings - city hall, 6 museums, 5 churches, 6 cemeteries, 2 arts theaters, and a 450-student school). This diversity in such a compact area creates not only a charming and livable neighborhood, it provides significant revenue to the city. Since the value per acre is higher, the taxes paid per acre are higher, and yet the infrastructure and services required are lower. The efficient planning of the area requires fewer miles of roadway, water and sewage lines per person, while trash and recycling services are vastly more efficient, and therefore cost-effective, than more widely dispersed (off-peninsula) areas of the city. The demand for the charm of Charleston-style urbanism is growing, but the supply is not. Long-time residents are finding it unaffordable to live in the place they know as home. Cities change, and there is little one can do to stop gentrification trends, but the simple act of making more of what is in demand may be enough to take pressure off of existing neighborhoods and communities. The only viable solution to relieve the demand for Charleston is to make more of Charleston. Historic Districts are sometimes accused of being the generator of gentrification because low-income residents cannot afford to upkeep their home to the standards of a board of architecture review - this argument is based on a valid point: there may be cheaper alternatives than proper care of an historic house or building. However, the solution isn't to lower the standards, but to bolster the local building economy by promoting participation in it, by supporting local craftsmen, and by finding financial support for neighbors who need it. The Texas-donut is not a bad building type, per se. This type was conceived as a means to help revitalize struggling midwestern downtowns by housing people who want to move back to the city in the absence of public transportation. But Charleston's historic district isn't dead or dying - it's thriving! So much so that it is becoming unaffordable. But that doesn't mean there might not be other places in the city that would benefit from such an injection of density. Citadel Mall, built in 1981 and recently foreclosed, is preparing redevelopment plans as part of the city's West Ashley Strategic Plan. Near the intersection of I-17 and I-526, about 5 1/2 miles from downtown Charleston, it is an excellent place for a mixed-use town center. 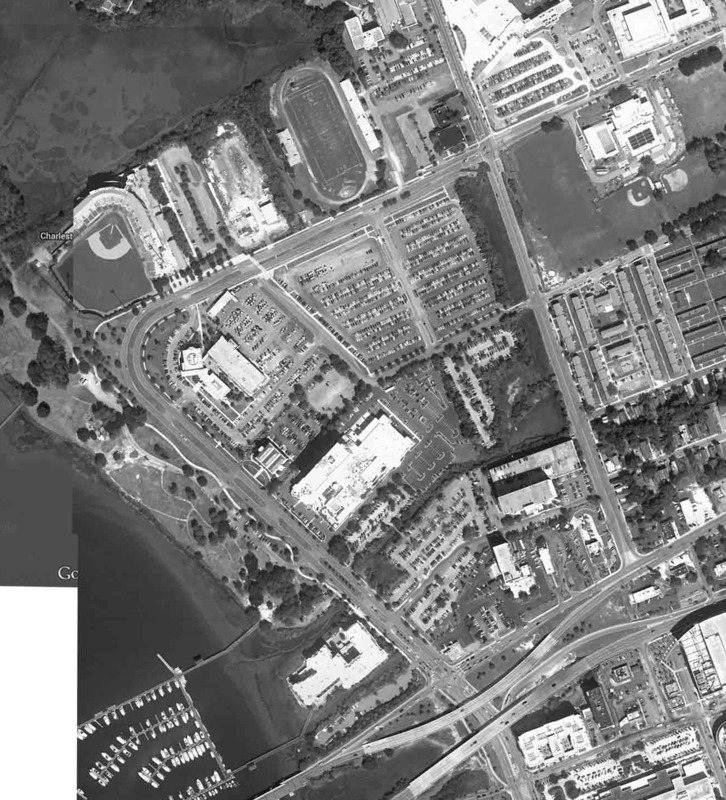 MUSC's peninsular campus could be connected to new medical offices by a public transit line. Solutions like this case study are not just hypothetical: new developments that follow local patterns of architecture and urbanism are being built all around the world with great success. 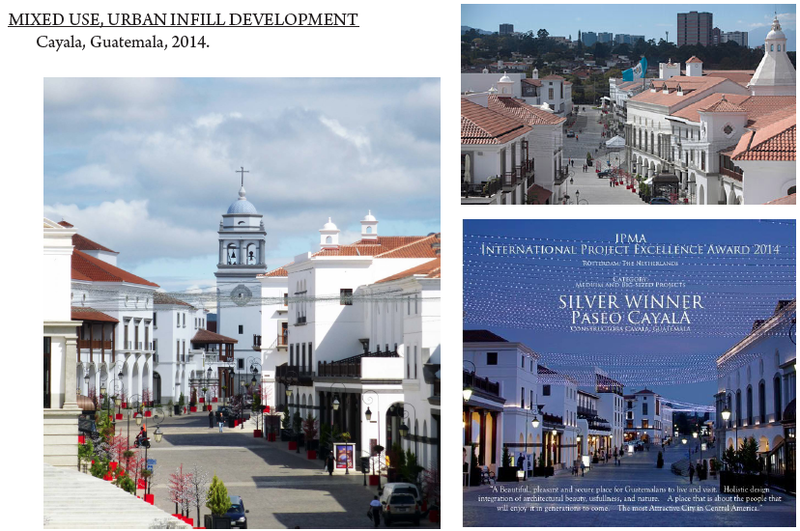 Below are images from four recent projects: Baker Street in London; Cayala adjacent to Guatemala City; a project outside of Paris; and Poundbury, an extension to the town of Dorchester, England. The main criticism these projects receive is that - because they are in such high demand - even if their prices begin low, they quickly become too expensive for the great diversity needed for a sustainable city. The only solution to that problem is to build more like them. Charleston is home to one of architecture's unique contributions: the Charleston single-house. What is less known is that Charleston is also home to one of urbanism's unique contributions: side-yard urbanism. Although this type of urbanism works well with single-houses, it is not dependent on them, and it is used throughout Charleston even where there are no single-houses. It is characterized by clearly defined public streets and squares, deep lots, and the locating of the buildings, which are kept narrow to catch the breeze, on the side of the lot, creating gaps between buildings on successive lots. It is an ingenious solution to achieving an urban level of density that is yet livable in a hot, humid, sub-tropical climate. Charleston's blocks are highly permeable, diverse, and granular. The Texas-donut offers only one type of housing and one type of retail, resulting in an area of monoculture. Charleston's urbanism is defined by a diversity of building types in varying sizes that are flexible, adaptable, and able to respond to changing markets. Charleston's urbanism accommodates single-family homes, duplexes, tenements, apartment houses, offices, inns, hotels, shops, corner stores, grocers, restaurants, bars, cafes, schools, churches, libraries, and institutions that enrich the urban experience and provide a diversity of job opportunities for a diverse citizenry. The best way to achieve this is through incremental development. Charleston has a hot, humid, sub-tropical climate. Urbanism that accommodates shading porches and loggias, gardens, and courts, is more livable than urbanism that fills in the entire block. Charleston's urban character is defined by blocks that are highly permeable. This allows buildings to take advantage of breezes and rooms to have windows on multiple exposures. While dense, Charleston's urbanism balances first-rate private space with a first-rate public realm in the form of clearly defined streets, many of which are veritable linear parks. 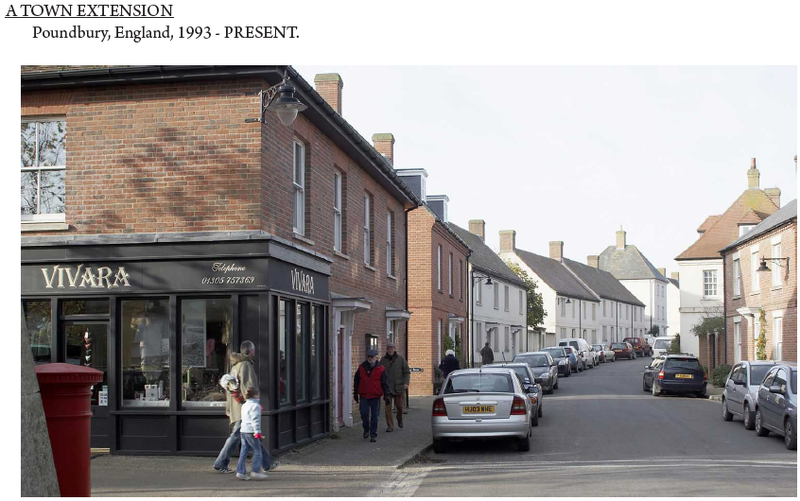 Charleston-style urbanism is characterized by an interconnected network of varied street-types which reduces congestion, increases safety, and provides a structure for multi-modal transit. It has also been mixed-use since 1670, and the infrastructure to get everything one needs for daily life within walking distance is there. Charleston's urbanism is characterized by narrow fronts, which puts more people onto the street than do block-sized buildings with entrances from behind. Local patterns of urbanism and architecture contain within them a wealth of information on climatically-appropriate design and construction. Charleston-style urbanism responds to the conditions of the site, incorporating both old solutions, and recent lessons on building in balance with nature. The Texas-donut model varies very little from place to place, or even from its north face to its south. By investing in the infrastructure that makes new development possible, the city and its citizens have a financial stake in the long-term value of new developments. The return on investment for Charleston-style urbanism is greater, and longer-lasting, than urban patterns based on short-term profit models. leave your email address to stay in touch with CivicConservation.org.